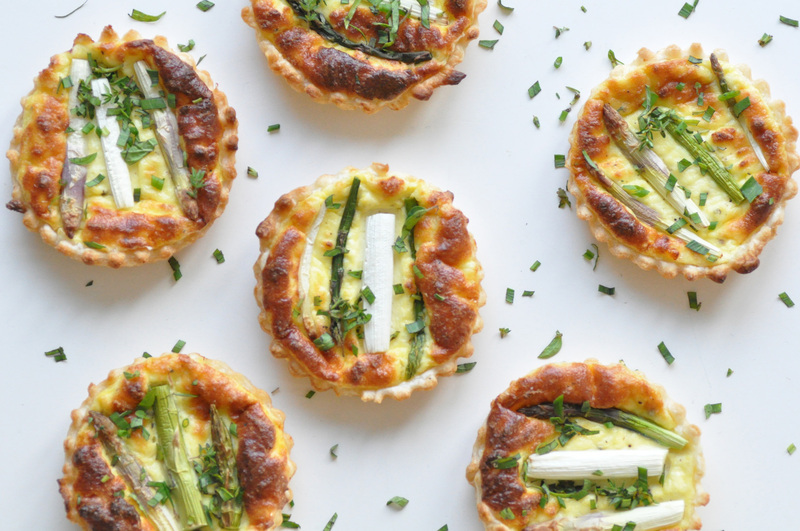 these have been the best asparagus tartlets i ever had! it might be due to the homemade ricotta or because of the lemony flavor of the whole thing or the fresh herbs on top – i don’t know. and it doesn’t matter, they are simply excellent … and they look very beautiful by the way! they are good while still warm, but also cold for a picknick or for a lunch the next day. if you will make your ricotta by yourself as i did you will have about 500 g ricotta leftover. you can have it for breakfast with some dandelion flower syrup for example or you can make ricotta gnocchi which i will do very soon. making ricotta is much more simple than you might think. it is much more delicious than the store bought stuff, you can make it to your liking. a bit wet and creamy or dry and crumbly … and i guess it is also cheaper. if you start the ricotta one day in advance, the tartlets will be done very quickly. the idea for the recipe is from sweet paul magazine. i only replaced the recommended pastry by puff pastry. to prepare the ricotta, if you decide to do it yourself, start one day in advance: pour the milk and the cream in a large pan and warm up carefully until it reaches a temperature of 88°C, which is exactly the moment before it will start to cook. so if you have no thermometer it doesn’t matter, just observe it carefully. remove from heat and stir in the vinegar. this is the moment when it starts to clot. cover the pan with a kitchen towel an set aside for one hour. lay out a sieve with a second kitchen towel and strain your ricotta through. for a soft and creamy ricotta allow to drain for 30 minutes and for a more firm and crumbly one over night. what will remain is the whey as a side product of ricotta. you can make some lassis for example with the whey. if you are done with the ricotta or decided to use store bought, the recipe continues here with the asparagus tartlets. preheat the oven to 200°C. combine ricotta, cream, eggs, grated parmesan, lemon zest, salt and pepper. cut off the ends of the green asparagus and peel the lower part if necessary. cut the asparagus in pieces which will fit in your tartlet tins. lay your tartlet tins out with puff pastry and fill in the ricotta mixture. place three to four pieces asparagus on top. bake for 15 to 20 minutes until the ricotta mixture turns firm and golden. serve sprinkled with some olive oil and chopped herbs on top. wer sich entscheidet den ricotta selbst zu machen, sollte einen tag vorher beginnen: milch und sahne in einen großen topf geben und langsam auf 88° C erwärmen. wer kein thermometer hat, das ist exakt die temperatur bevor die milch-sahne mischung zu kochen beginnt. vom herd nehmen und den essig einrühren. das ists er moment, wo milch und sahne beginnen zu gerinnen. mit einem küchentuch abdecken und für eine stunde zur seite stellen. ein sieb mit einem küchentuch auslegen und den ricotta abseihen. für einen weichen ricotta genügt es ihn 30 minuten abtropfen zu lassen, für einen festeren besser über nacht stehen lassen. was übrig bleibt be der ricottaherstellung ist molke, aus der kann man zum beispiel lassis machen. wenn der ricotta fertig ist oder wer sich für gekauften ricotta entscheidet, geht das rezept für die spargel tartelettes nun hier weiter. den ofen auf 200°C vorheizen. ricotta, sahne, eier, parmesan, salz, pfeffer und zitronenschale mischen. vom grünen spargel die enden abschneiden und den unteren teil, wenn nötig, schälen. dann den spargel so schneiden, dass er in die tarteletteformen passt. die gebutterten tarteletteformen mit blätterteig auslegen und die ricottamischung einfüllen. auf jedes tartelette drei bis vier spargelstücken legen. 15 bis 20 minuten backen, bis der ricotta fest und golden geworden ist. mit etwas olivenöl beträufeln und frische kräuter darüber streuen. This entry was posted in recipes, spring and tagged asparagus, vegetarian by The Cook. Bookmark the permalink.